and a history of Orangeries in the Country House. 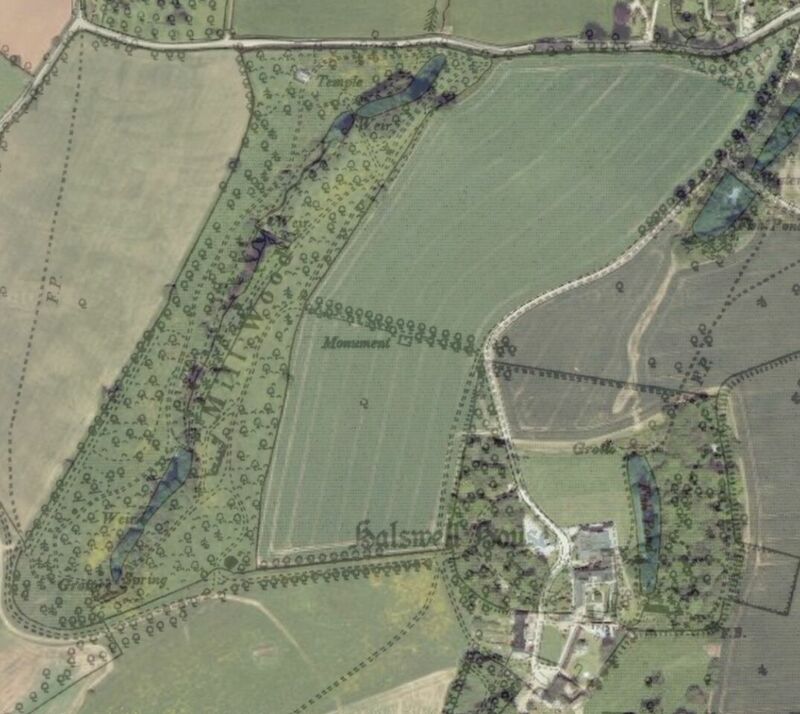 The Orangery at Halswell existed from at least 1756, the date of the earliest map of Halswell known to exist. 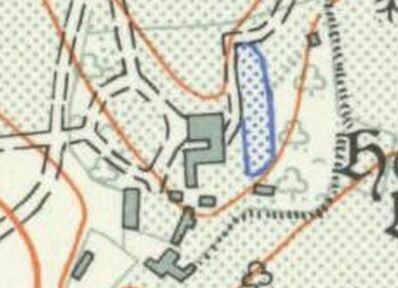 It appears to have still been standing in 1956 when the Ordnance Survey map of that date still shows the building. The exact dates of its construction and demolition are otherwise uncertain. 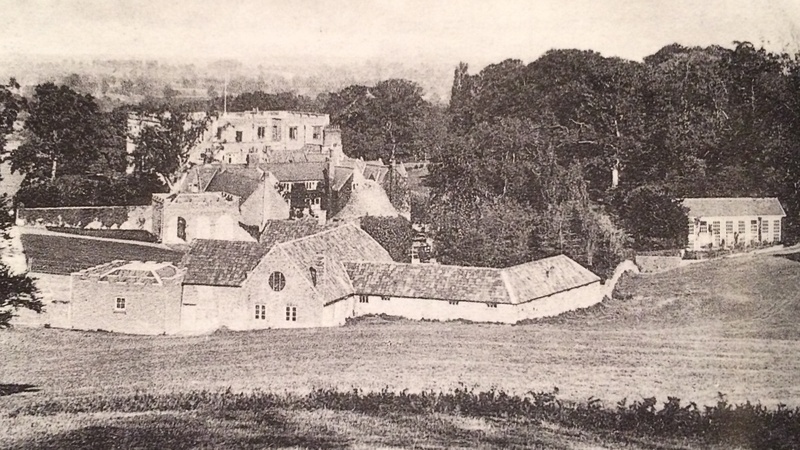 Halswell from the South Meadow, with the agricultural buildings in the foreground, the Dovecote and Tudor Manor in the centre ground, the Baroque North Wing in the distance and the Orangery to the right. 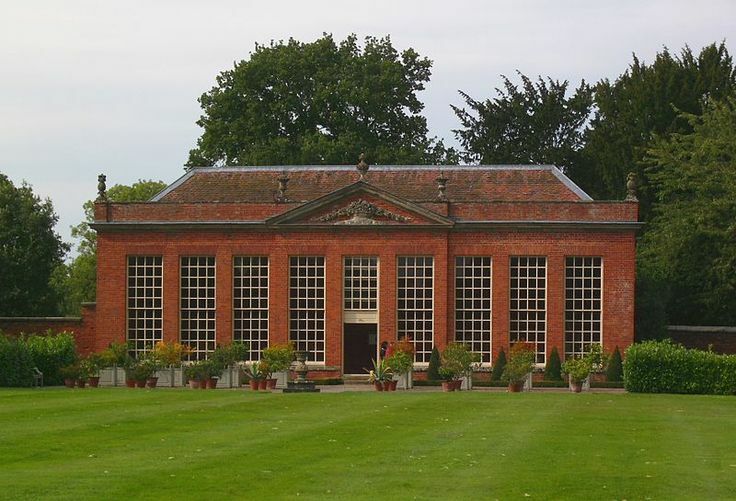 The orangery at Halswell appears to have had nine window bays each separated by pillar of redbrick as thin as the architect felt able to make them. The windows themselves were enormous, four glazing panes across and four down in each of the two sashes, a total of 288 glazing panes to the south side alone. 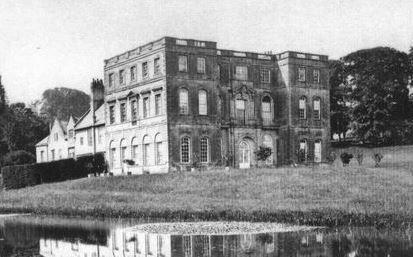 In this respect it would appear close in scale and proportions to that at Hanbury Hall, Worcestershire, which was built c. 1745. While Hanbury has a brick and stone dressed parapet with pediment decorated with a fruiting basket, all surmounted by five urns, Halswell had a simpler south face with a pitched roof. 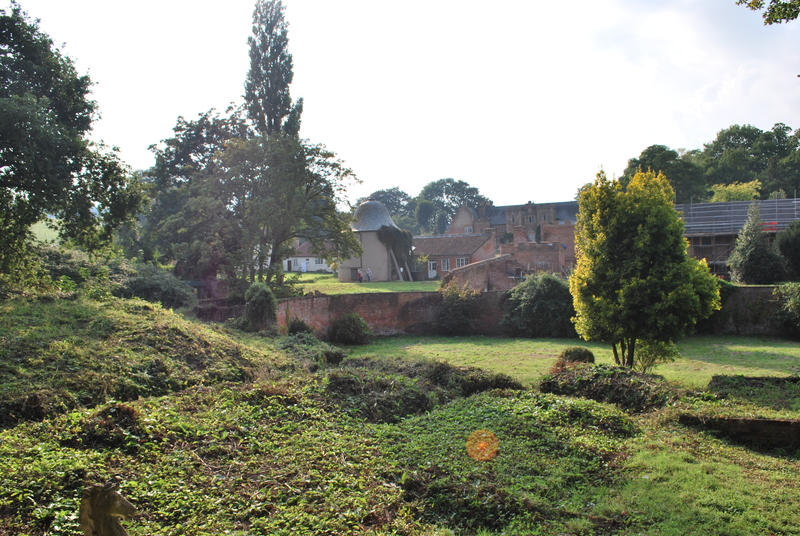 The Halswell orangery did not, as at Hanbury, face into a garden but up the meadow and away from the main garden areas which were further north and as such too much decoration on this elevation may have been felt unnecessary. The interior and east and west fronts remain a mystery until more photographic of painted images are found. The Orangery, Hanbury Hall, Worcestershire, c.1745. 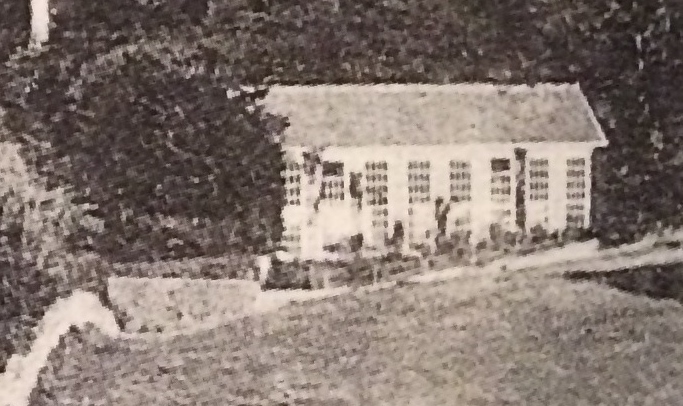 We know that the original purpose of the orangery, as a building to keep exotic orange trees or other delicate plants sheltered during the winter months, was still being maintained at Halswell right up to 1950 when the estate was broken up. 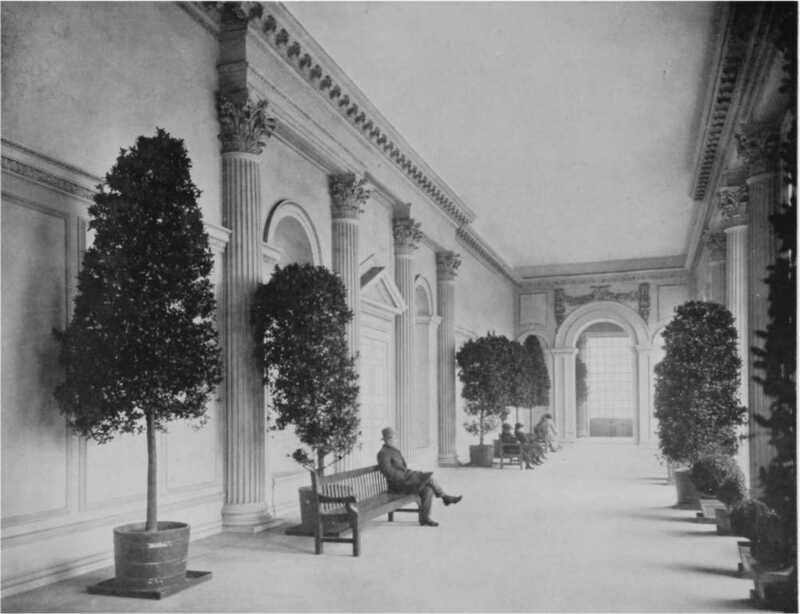 Though there are currently no visual or other records that relate to the interior orangery, there are repeated pictorial views of the north wing of the house which show potted trees placed outside during the summer months, while there are no potted trees outside in images taken during winter months. A strong indication that the building was still being used for the purpose for which it was built. c.1898. Potted trees placed around the north wing during the summer months. The existence of an orangery at Halswell before c.1750 is uncertain, however the building of large and formal gardens, c. 1690, in the seventeenth-century Dutch style in that was so fashionable after the Restoration does make the likelihood of such a feature possible at that earlier date. 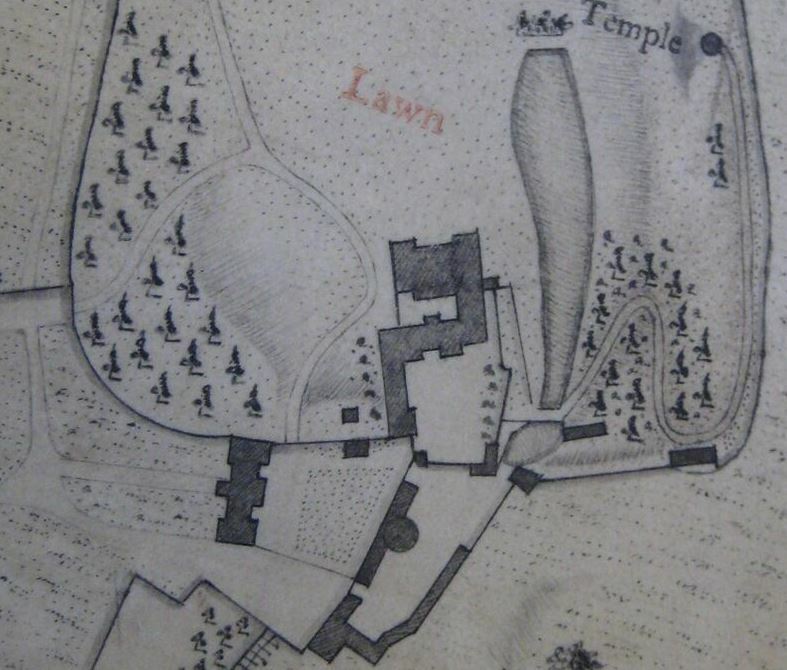 In fact one of the paintings of Halswell during this period clearly shows gardeners moving into place such potted trees almost 50 years before the 1756 map proves of the existence of the orangery on that site. 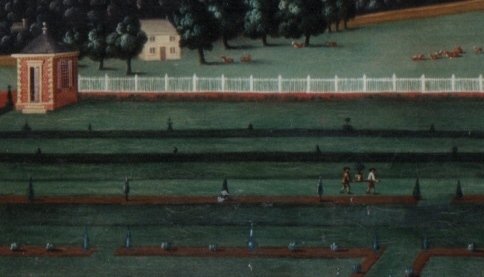 Halswell, painted c.1710, with gardens carrying potted trees into position in the formal layout. The Orangery (1904-09) by Edwin Lutyens (1869 –1944) at Hestercombe House. Whether the interior of the orangery at Halswell was anything as grand as the much later, but certainly spectacular, interior of the orangery at Hestercombe House remains to be seen. However once more detailed archaeology commences on the orangery foundations details in brick or stone will doubtless be amongst the grassy hills of rubble where much of the buildings materials will remain. Amongst these ruins there appear to be iron pipework for heating the interior, a Victorian or possibly 1920’s addition. There also appears to be a capped wellhead which would have provided water for the plants, and possibly more decorative element such a trickling fountain or even a grotto, a motif so beloved of the garden design throughout the Park during the 1740s and 1750s. At the head of the pond, just outside the orangery, was built a rusticated stone waterfall area, similar to one unearthed at the southern end of the pond during archaeology in 2014. 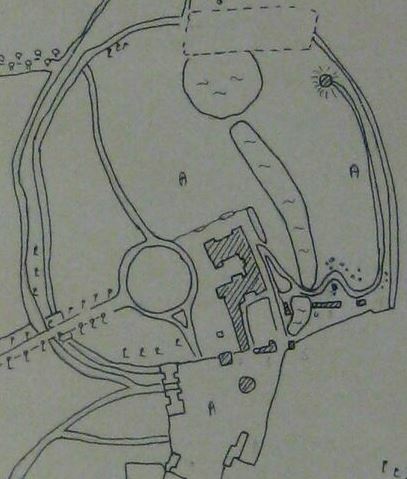 The earthworks and foundations of the lost Orangery at Halswell, situated to the northeast of the pond, just within the Ha-Ha. 1771 Estate Map by William Day. 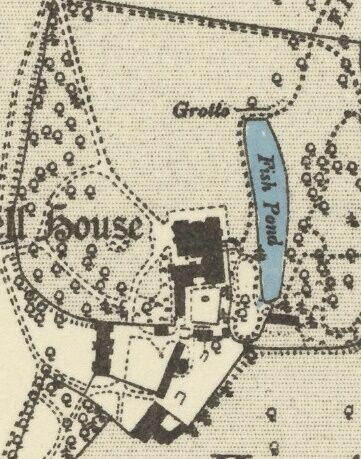 OS map of 1956 showing the orangery, south of the pond, still standing. An orangery or orangerie was a room or a dedicated building on the grounds of fashionable residences from the 17th to the 19th centuries where orange and other fruit trees were protected during the winter, similar to a greenhouse or conservatory. The orangery provided a luxurious extension of the normal range and season of woody plants, extending the protection which had long been afforded by the warmth offered from a masonry fruit wall. A century after the use for orange and lime trees had been established, other varieties of tender plants, shrubs and exotic plants also came to be housed in the orangery, which often gained a stove for the upkeep of these delicate plants in the cold winters of northern Europe. 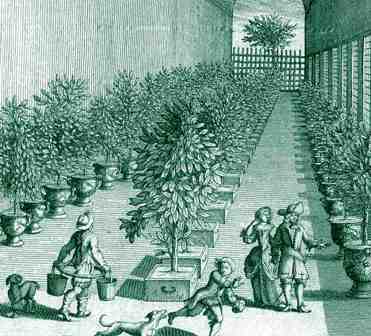 As imported citrus fruit, pineapples and other tender fruit became generally available and much cheaper, orangeries were used more for tender ornamental plants. The orangery originated from the Renaissance gardens of Italy, when glass-making technology enabled sufficient expanses of clear glass to be produced. In the north, the Dutch led the way in developing expanses of window glass in orangeries, though the engravings illustrating Dutch manuals showed solid roofs, whether beamed or vaulted, and in providing stove heat rather than open fires. This soon created a situation where orangeries became symbols of status among the wealthy. The glazed roof, which afforded sunlight to plants that were not dormant, was a development of the early nineteenth century. The orangery at Dyrham Park, Gloucestershire, which had been provided with a slate roof as originally built about 1702, was given a glazed one about a hundred years later, after Humphrey Repton remarked that it was dark; though it was built to shelter oranges, it has always simply been called the “greenhouse” in modern times. The 1617 Orangerie (now Musée de l’Orangerie) at the Palace of the Louvre, inspired imitations that culminated in Europe’s largest orangery. Designed by Jules Hardouin-Mansart for Louis XIV’s 3,000 orange trees at Versailles, its dimensions of 508 feet (155 m) by 42 feet (13 m) were not eclipsed until the development of the modern greenhouse in the 1840s, and were quickly overshadowed by the glass architecture of Joseph Paxton. Notable for his 1851 design of the Crystal Palace, his “great conservatory” at Chatsworth House was an orangery and glass house of monumental proportions. As early as 1545 an orangery was built in Padua, Italy. The first orangeries were practical and not as ornamental as they later became. Most had no heating other than open fires. In England, John Parkinson introduced the orangery to the readers of his Paradisus in Sole (1628), under the heading “Oranges”. 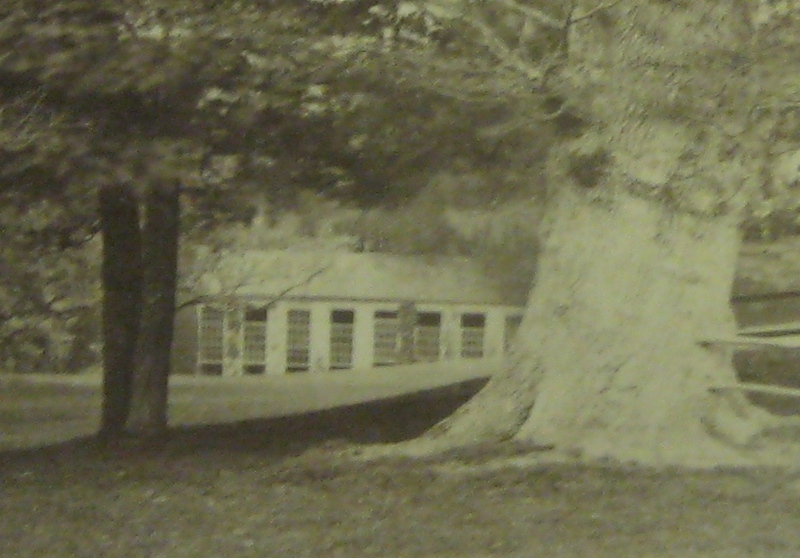 The trees might be planted against a brick wall and enclosed in winter with a plank shed covered with “cerecloth”, a waxed precursor of tarpaulin. “For that purpose, some keepe them in great square boxes, and lift them to and fro by iron hooks on the sides, or cause them to be rowled by trundels, or small wheeles under them, to place them in a house or close gallery”—which must have been thought handsomer than the alternative. The building of orangeries became most widely fashionable after the end of the Eighty Years’ War in 1648. The countries that started this trend were France, Germany, and the Netherlands, these countries being the ones that saw merchants begin importing large numbers of orange trees, banana plants, and pomegranates to cultivate for their beauty and scent. 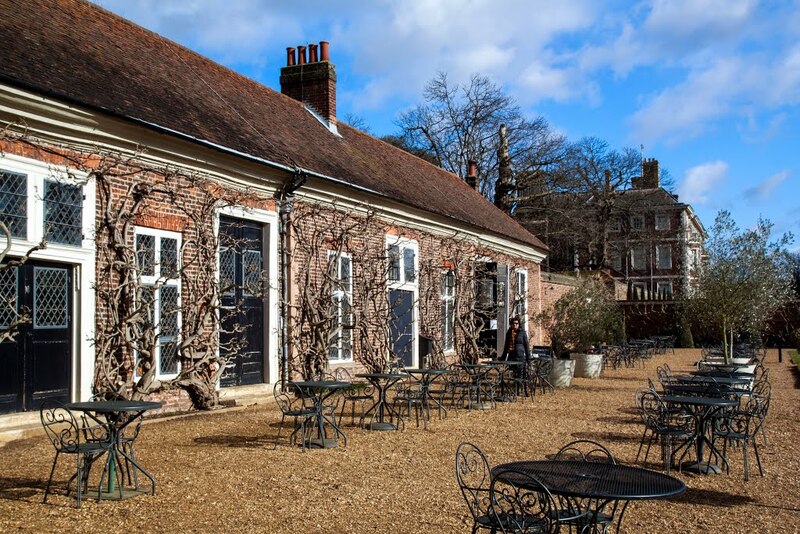 In Britain the oldest surviving orangery is that at Ham House in Surrey. This early building has comparatively small windows, large areas of brick on its south side, thick mullion and transom window bars and diamond leaded lights, all of which would be swept away as glass making and building techniques developed over the next 50 years. Ham House, Surrey, Orangery, 1674, the earliest existing example in the UK. Contemporary domestic orangeries are also typically built using stone, brick and hardwood, but developments in glass, other materials, and insulation technologies have produced viable alternatives to traditional construction. The main difference with a conservatory is in the construction of its roof – a conservatory will have more than 75 per cent of its roof glazed, while an orangery will have less than 75 per cent glazed. Domestic orangeries also typically feature a roof lantern. Improved design and insulation has also lead to an increasing number of orangeries that are not built facing south, instead using light maximising techniques to make the most of available natural sunlight. 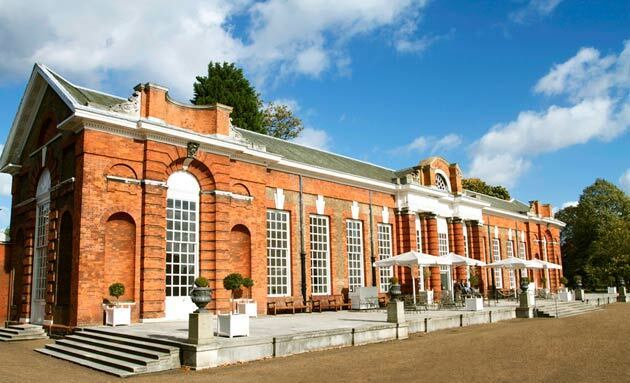 The orangery at Kensington Palace (1761) is the earliest surviving work there by Sir William Chambers. At 28 m (92 ft) long, it was the largest glasshouse in Britain when it was built. Though it was designed as an arcade with end pavilions to winter oranges, the light levels under its solid roof were too low for it to be successful. Kensington Palace Orangery, built after the Orangery at Halswell, in 1761. Other Orangeries of note in England include the orangery at the Royal Botanic Gardens, Kew, which was designed in 1761 by Sir William Chambers and at one time was the largest glasshouse in England. The orangery at Margam Park, Wales, was built between 1787 and 1793 to house a large collection of orange, lemon and citron trees inherited by Thomas Mansel Talbot. The original house has been razed, but the surviving orangery, at 327 feet (100 m), is the longest one in Wales. There is an orangery dating from about 1700 at Kenwood House in London, and a slightly earlier one at Montacute. 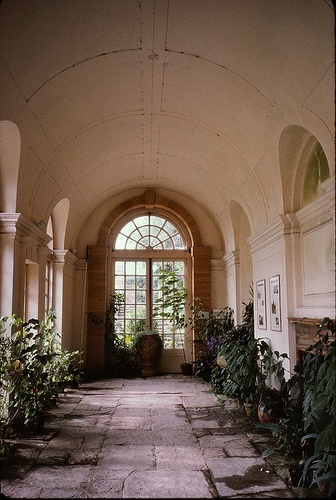 Other orangeries in the hands of the National Trust are at Ham House & Garden, Richmond, Surrey, Hanbury Hall, Worcestershire; Ickworth House, Suffolk, where it forms part of the garden front of the dwelling wings; Powis Castle, Montgomeryshire, a central feature on the late-eighteenth-century terraces; Saltram House, Devon, probably to a Robert Adam design; Seaton Delaval Hall, Northumberland; and Blickling, Norfolk. A recent orangery was constructed in 1970 by Victor Montagu in his formal Italianate gardens at Mapperton, Dorset.